Even after many successful years as a designer, Markham Roberts is still a bit of an enigma. Understated and seemingly happy to be a bit under the wire, he has, since 1997, been discreetly working away, accumulating a wide ranging and impressive portfolio. 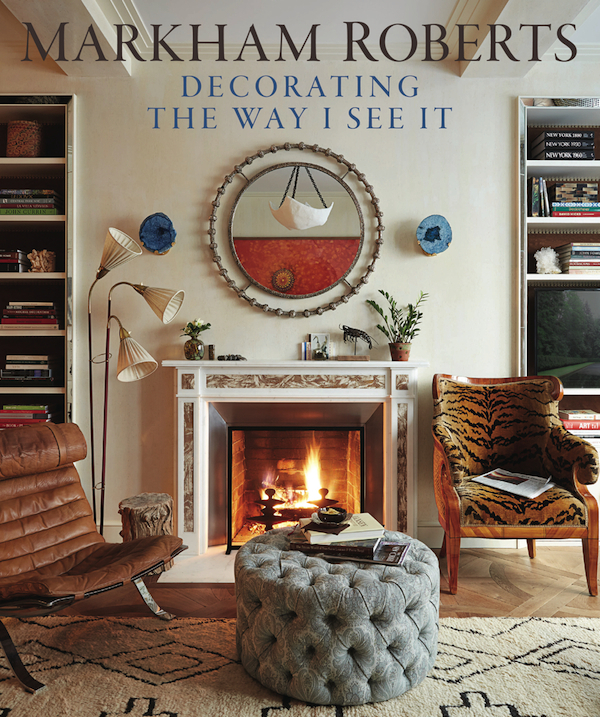 And now many of his projects can be seen together in his splendid new book, Decorating the Way I See It, just out from Vendome. Like his work, Markham Robert’s book is luxurious but unintimidating. Divided into digestible chapters, it is inspiring and informative. In The Basics, he discusses the all important floor plan, showing how rooms can be elegant yet inviting, with flexible seating that is as appropriate for a family evening as for a large party. For large rooms such as this, Markham often includes areas for convivial activity, such as bars or game tables (see the chic fabric covered backgammon one on the right of the photo). In another chapter, he discusses how backgrounds set the tone for a room, sharing a wide variety of examples. From gorgeous lacquers, to grasscloth to a plethora of papers, wall treatments, such as the sumptuous teal silk wall upholstery below, set off all the other elements. 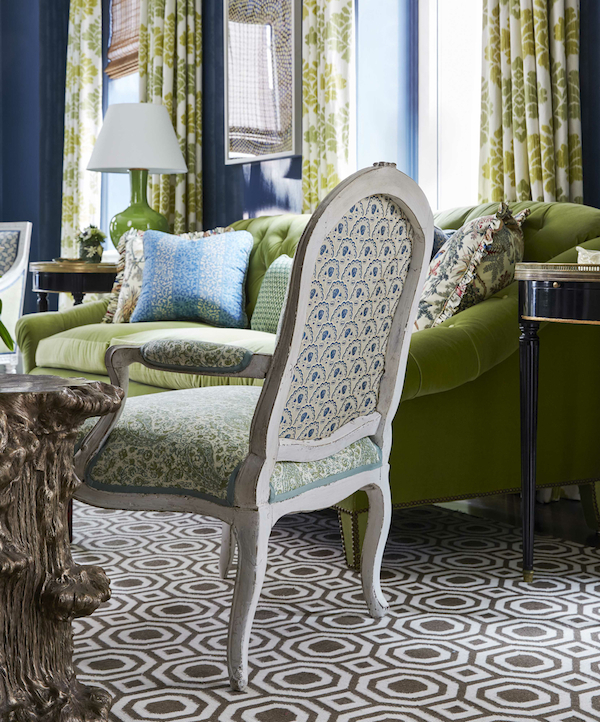 Even a bold pattern can become a unifying feature, integrating seemingly disparate pieces into a cohesive whole. 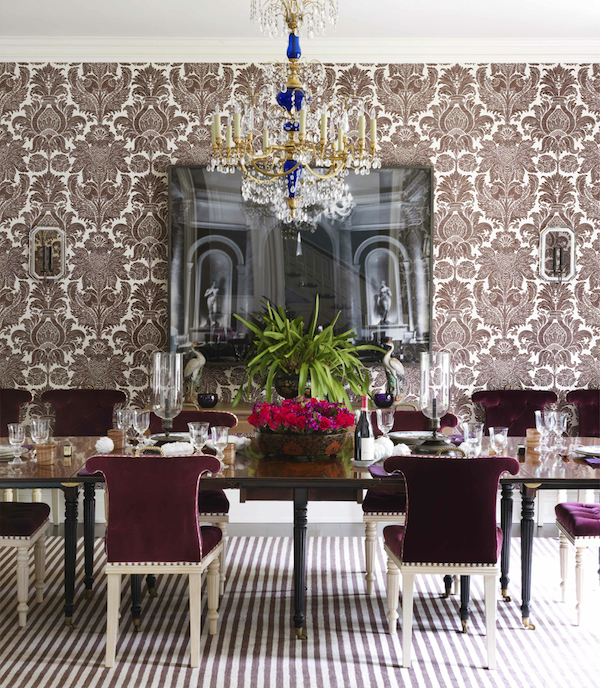 Below, the large scale damask echoes the curves of the chandelier and backs of the chairs, creating a lively dialogue. Markham is not defined by a single style but in all of his rooms there is a fine layering and balance of solids, patterns and colors. And even when incorporating what might be considered old fashioned fabrics, his rooms feel fresh and approachable, entreating you to sit and stay a while. 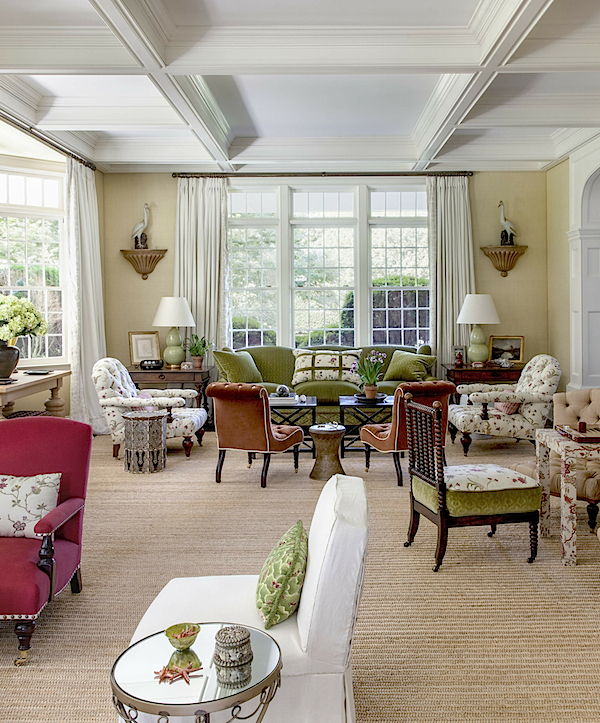 In the living room of a Sutton Place apartment, below, Markham used a Louis XV fauteuil from the young client’s grandmother, covering the front in a youthful Indian paisley and the back in a documentary French silk. In fact, the room features a different pattern on almost every piece – whether pillow, furniture or lampshade. Throughout the book, Markham injects his dry sense of humor. I totally related to his comment about the wonderfully chic office he designed for a friend with four children, three dogs and a husband who works at home (check, check and check – except I’ve only one dog – but a big one). He said he wanted to give her the option of perhaps sneaking a nap in the solitude of her private domain but adds, in parentheses, (good luck finding that time!). Check! Art gives any room personality and Markham includes many examples of how it relates to, echoes and enhances any environment. The room below includes a photograph of one of my all time favorite artists, photographer Candida Höfer. Art adds depth and meaning to any space but even Markham was surprised by the amazing connections it had to the color and patterns of the scheme, once hung. There has been much talk this year in the industry of the importance of bespoke. The value of artisans, custom workrooms and one of a kind pieces elevate interiors to unique and personal living spaces. 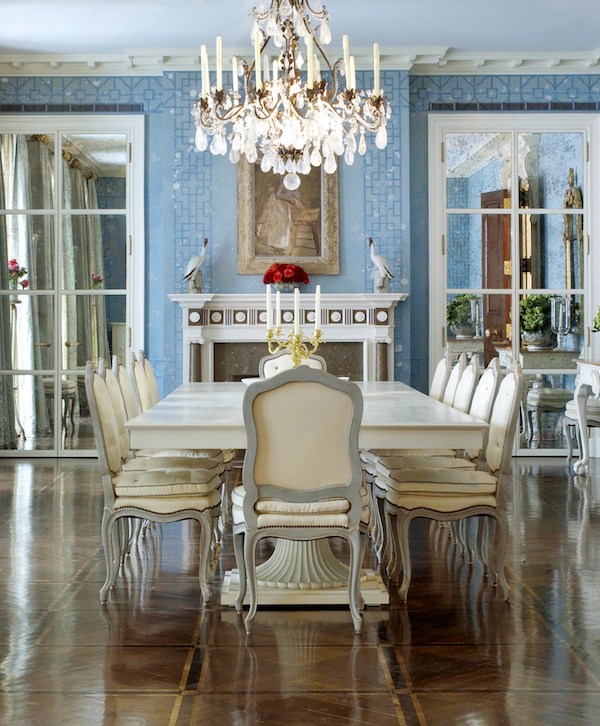 Markham devotes a chapter to the art of custom, opening it with this spectacular dining room in a renovated Beaux-Arts mansion in New York City. Everything in this room, from the mantel, to the stenciled floor, the table (designed to accompany the Jansen chairs) and the amazing mural by Agustin Hurtado, after Markham’s design, is custom. It is the ability to have both the creative vision and the knowledge and possibilities of craft that makes designers like Markham Roberts a rare breed. And while not an architect, Markham frequently contributes in this arena as well. 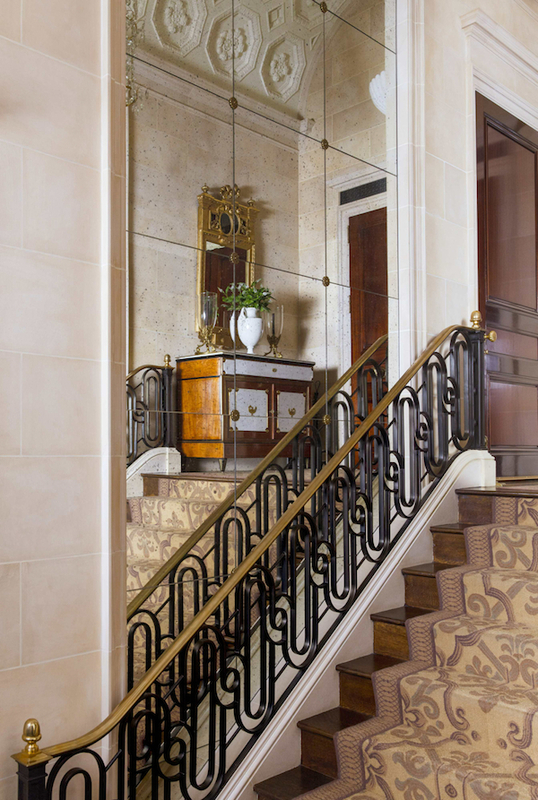 Taking the Greek and Roman galleries at the Metropolitan Museum as inspiration, he created this magnificent two story stair hall in a Carnegie Hill triplex. Mirrored niches, adding visual width, walls of faux limestone blocks, a custom brass and iron banister and an amazing vaulted, coffered plaster ceiling (reflected in the mirror) all contribute to the architectural authenticity of the space, in keeping with the early 20th century grandeur of the building. The importance of architectural elements outside is also considered. 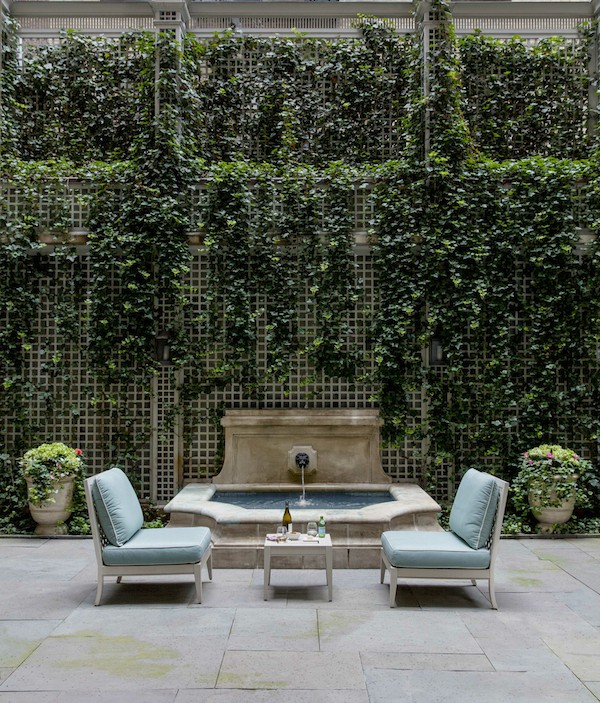 Markham added the cast stone fountain to this gorgeous trellised garden his firm designed for an Upper East Side townhouse. Appealing to all the senses, the sound of trickling water is a soothing respite from city life and I love the way the water reflects the color of the cushions on the charming McKinnon and Harris chairs. 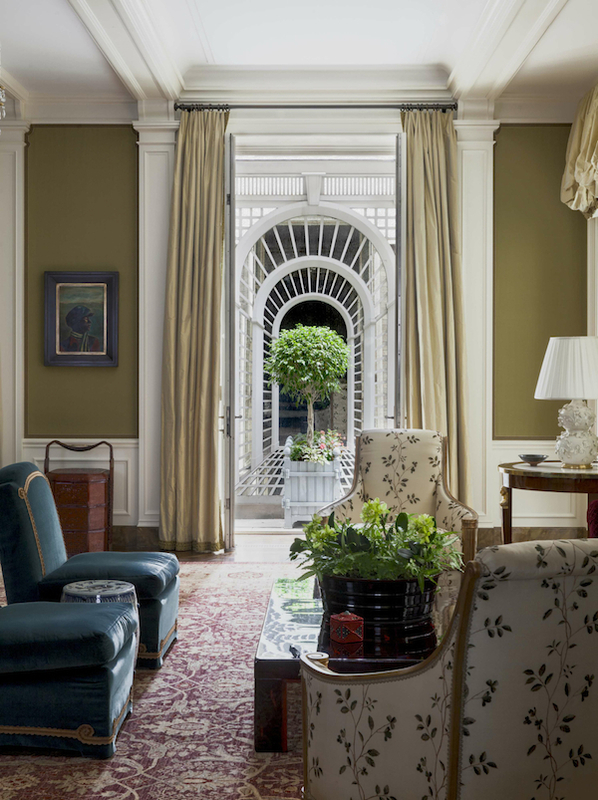 Inside the same townhouse he installed a tromp l’oeil trellis beyond each pair of French doors overlooking the garden to create a sense of depth and space beyond. Inspired by Boromini’s famous forced perspective corridor at the Palazzo Spada in Rome, Markham added, à la Sir John Soane, mirror behind the trellis to bring in extra light – all a visually elegant, historically informed clever ruse. Another favorite architectural installation is this tennis court pergola for a client in Palm Beach. 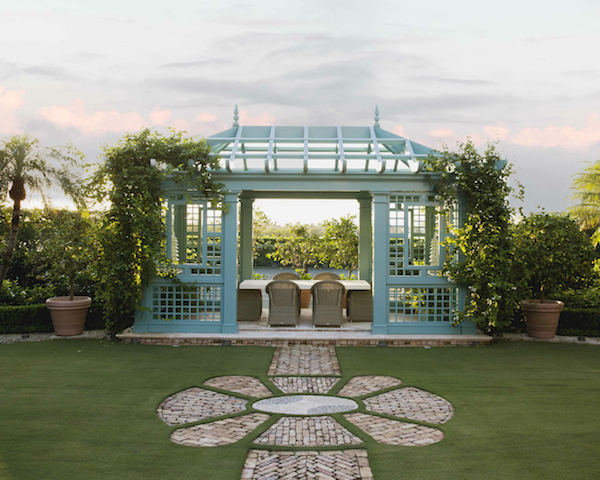 Combining Chinese Chippendale style with fresh color and modern practicality, it will provide complete shade with stunning style as the vines grow to cover the structure. In the last chapter of the book, Markham shares images of the homes he shares with partner James Sansum, whose fine and decorative arts gallery is a NYC destination for those in the know. 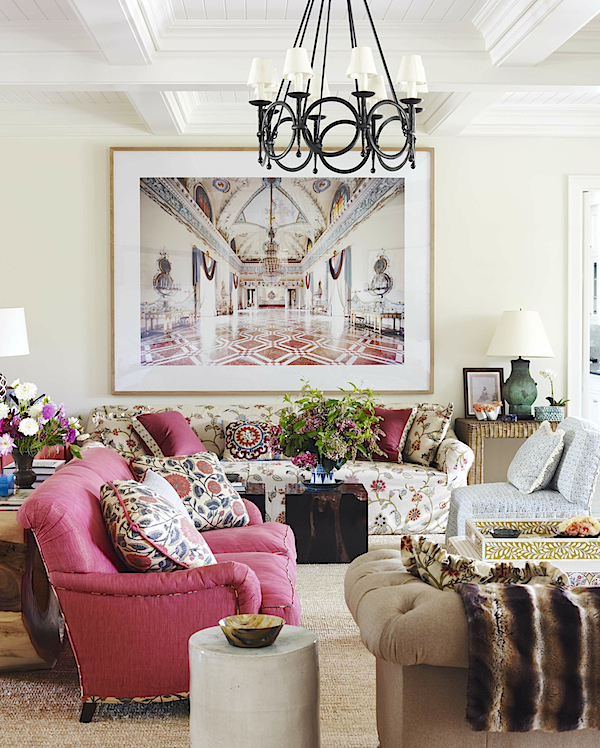 They are perfect examples of how to live with what you love, incorporating inherited pieces with those newly purchased to create a relaxed but gracious home. I love this corner in James’ Port Townsend, Washington cottage. It’s cozy, timeless and oozing with charm. 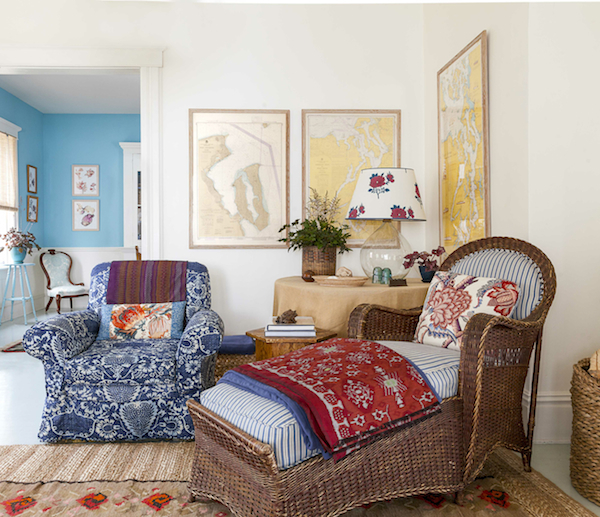 Their Hudson River Valley house is an intoxicating mix of “things that make us happy or hold meaning for us… Victorian furniture, Asian lacquer, Karl Springer pieces, bamboo and wicker antiques and comfortable tufted, upholstered furniture.” The result is enchanting. 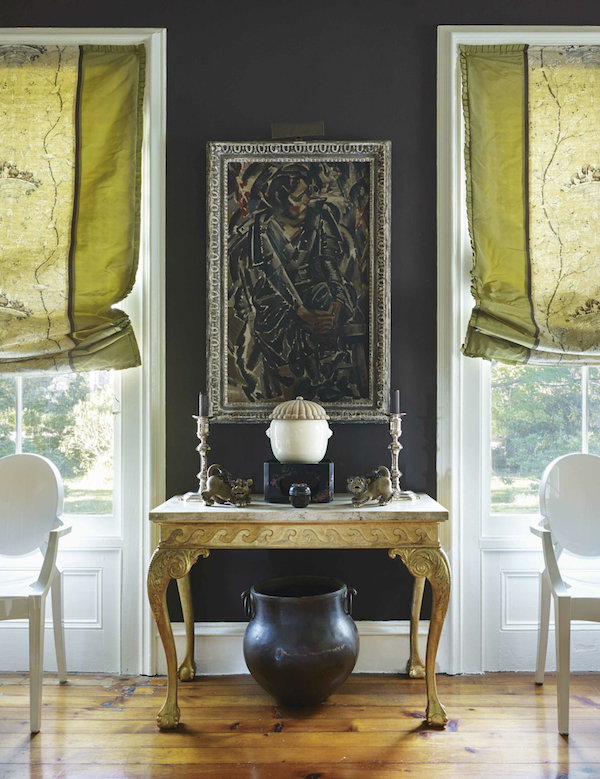 The glamorous plummy brown dining room is a heady mix with Chinese shishi figures, a gilt Georgian console and a Cubist painting. Even the bathrooms are a marvelous melange of family treasures and spoils of the find. Markham describes the assembling of all his pieces “like putting quibbling siblings in a room until they all get along famously.” Clearly his “siblings” have resolved their issues. Markham Roberts Decorating The Way I See It is a total delight. With inspiring imagery, practical information and some amusing banter, you’ll find yourself fully immersed from page one. And I think you’ll discover, as I have, that the way Markham sees it is a pretty good view! This entry posted in books, design, furniture, interior design. Entry Tags: Decorating, decorating books, Design Books, interior design, Interior Design Books, Markham Roberts Bookmark the permalink. Thank you Stacey for introducing me to Markham Roberts. I adore his style and love each and every image on this post! Superb!! Oh my! I don’t know what is more beautiful—Markham Robert’s design work or him! Both are perfection. The wall treatment in the Beaux-Arts mansion, that gorgeous console in the Carnegie Hill triplex– is that a bas-relief on top of the stairs that is reflected in the mirror?—whatever it is it’s to die for– that cottage nook so utterly charming and inviting (even the lampshade is genius! ), that fabulous striped rug in the fantastic dining room and what has to be one of the few most delightful, appealing, old school Romantic bathrooms I have ever seen…….I’m ordering his book right now…can’t wait to read it! 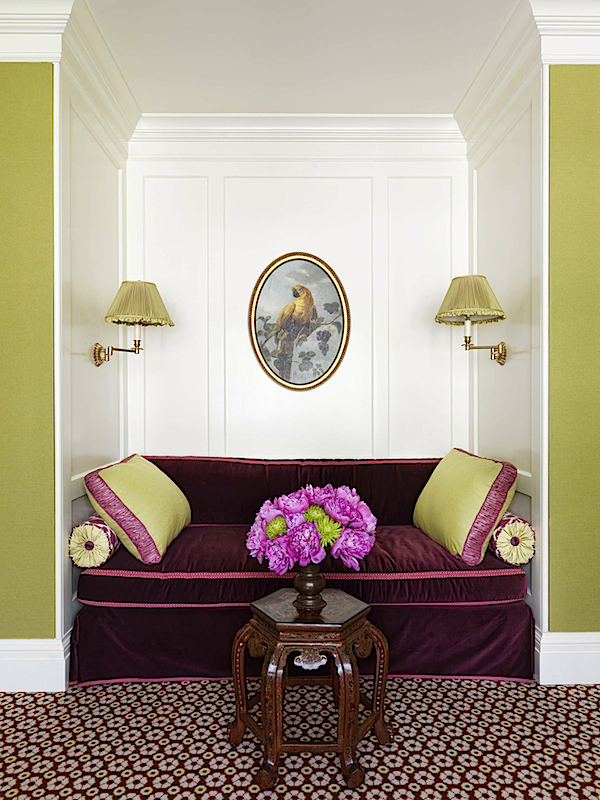 I do want to add a footnote that I hope the fur throw in the room with the Candida Höfer photograph is faux. I can’t believe a man like Markham who is capable of creating such exquisite beauty would countenance the horrific captivity and savage slaughter of animals for decor. Beautifully written–I’m going right over to Amazon. Thank you for the heads-up. A gorgeous feature for Markham, Stacey! I just recieved his book and look forward to perusing every page! 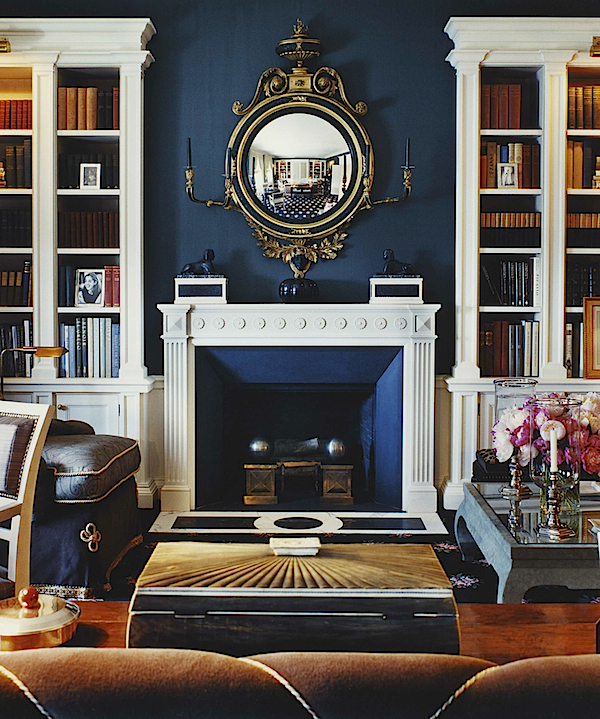 While we certainly agree with the importance of bespoke, his rooms are gorgeous. Noticed and appreciate his frequent use of the color green. Wonderful feature on such a talented designer! The outdoor teal pagoda is just stunning – would love to enjoy a sunset with friends under there!! Remarkable! Those samples of interior designs are truly inspiring. Markham Roberts is unquestionably gifted with this kind of craft. Every pieces of furniture and decoration used are definitely stylish and fresh. I can’t get enough with all the photos, they are all amazing! 79 queries in 0.465 seconds.